When it comes to loosing weight after a baby, patience is key. Many new moms feel overwhelmed and even bogged down by the idea of shedding the extra weight. It is important to realize that all women experience these initial feelings after birth. Remember you just brought a new life into the world! A healthy diet is an essential part of losing weight after having a baby and it is especially an important aspect to consider if you are breastfeeding. The best way to eat fewer calories is by decreasing the amount of empty calories you are eating. "Empty calories" are the calories from added sugars and solid fats, in foods like soft drinks, desserts, fried foods, cheese, whole milk, and fatty meats. Look for choices that are low-fat, fat-free, unsweetened, or with no-added-sugars. They have fewer "empty calories." Click Here to go to choosemyplate.gov to create a personalized plan, based on your age, gender, height, weight, physical activity level, and stage of pregnancy or breastfeeding status (pregnancy and breastfeeding options display upon providing your gender and age). You will have the option to register to save your profile if you want. 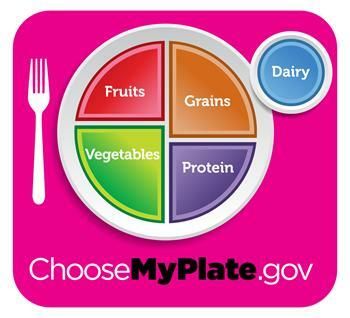 Click here to access choosemyplate.gov for a full realm of dietary, weight management, and physical activity information and resources! Breastfeeding is best for moms and their babies for several reasons. Besides providing nourishment and helping to protect your baby against becoming sick, breastfeeding may help you lose the weight gained in pregnancy. Moderate exercise and eating less can help breastfeeding mothers lose weight. A great time to lose weight after pregnancy is while breastfeeding. While you are breastfeeding, your need to increase your fluid volume. You may notice that you are thirstier than before. Drink enough water and other fluids to quench your thirst. Use caution when drinking beverages containing caffeine or alcohol. These substances pass from your bloodstream into your breast milk and to your baby. Drinking a moderate amount (less than 200mg) of coffee or other caffienated beverages does not affect your baby. Some baby's may tolerate caffeine better than others. Breastfeeding provides many benefits. Do not stop breastfeeding altogether just because you would like to have an occasional drink. One other thing to keep in mind if you want to try losing weight after a baby: Exercise does a body good. And even though you're super busy, you can always find ways to start exercising with your baby. Some ideas could include taking out the stroller, doing yoga (some programs are specifically designed to do with your baby), or doing crunches while your baby is playing next to you on the floor. Always make sure you've gotten permission from your physician before starting back on your exercise routine. Besides helping you with your weight loss after delivery, a nice walk with your baby in a nearby park or playground is a great way to meet other moms.